Condemned by the Nazis, this masterwork's acerbic politics and satirical themes merge with humanity's search for happiness. Three run away criminals are chased by the police: the widow Begbick (charged with fraud), Moses (charged with armed robbery) and Fatty (charged with embezzlement). They are stuck with their car in the middle of nowhere where Begbick suggests that they will found a city of pleasure – the city of Mahagonny. People from all over the land come to live in Mahagonny. First arrive seven prostitutes including Jenny who are all seeking dollars, whisky and men. They are followed by four wood cutters, Jim, Jake, Bill and Joe, eager to fathom the delights of Mahagonny with the multitude of dollars they saved while working for seven years in Alaska. Begbick offers her girls to the four men who with their dollars can buy anything, including human beings. Jim chooses Jenny as his woman. 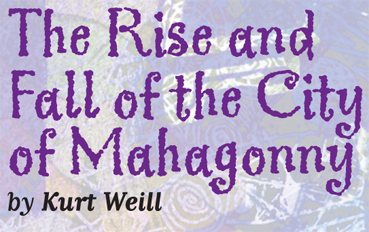 As a financial crises looms, many people start to leave Mahagonny. But a lot of these men return in order to make Mahagonny prosper yet again. Jake, Bill and Joe try to restrain Jim who in his turn wants total freedom and rebels against the local laws. As a typhoon approaches, the citizens prey for their safety while Jim declares that in order to be happy all rules should be disobeyed. The typhoon misses the city - the threatening deluge skipped the city of sins. The citizens are happy – nothing can harm them any more. They enjoy gluttony and love making as well as gambling on boxing matches and drinking day and night. Jack eats himself to death. Begbick enjoys huge profits at her brothel and the men bat huge sums in boxing fights. Jim bats against all odds that Joe will win his boxing bout with Moses, however it is Moses who kills Joe with his punch and Jim looses all his money, yet still orders drinks for everyone at the bar. When Begbick demands payment for the drinks, Jim asks for help from his friends but even Jenny will not lend money to her man. Penniless, Jim is considered to have made the greatest crime of all in the city and is put in jail where he hopes the sun will never rise as sunrise means the gallows for him. Court is the major attraction in town. Moses is the prosecutor who also sells tickets to those who wish to attend the court sessions. Fatty is the defense lawyer and Begbick is the judge. In one trial Toby is tried for murder, yet he bribes the judge and the trial is annulled. The next defendant is Jim who has no money and not one of his close friends is willing to help him out. He is condemned for not being able to pay for the whisky he drank. And the penalty is obvious – death. Jim bids Jenny farewell and passes her over to his friend Bill. Stalling, Jim tries to talk about the existence of God. The people of Mahagonny put on a show in which God comes to Mahagonny and condemns its inhabitants for their behavior, threatening that they will rot in hell, yet everyone ignores his threats admitting that they already live in hell. After Jim's death, the citizens of Mahagonny remind themselves that their God is the dollar and it is the only governing value in their world.